Why do I blog this? 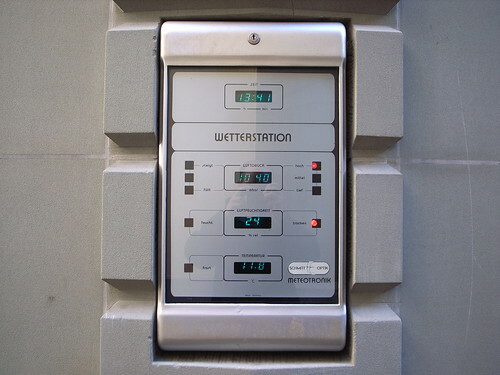 As it says in german, it's a "weather station" with time, temperature, pression, etc. Beyond the interface that I find amazingly retro-like, I find intriguing to have this sort of device on the street. It's actually an example of an ubiquitous computing device (so to say) that would make explicit invisible/implicit phenomena (such as temperature) to city dwellers. That machine is actually translating information about the state of the world to passers-by. Of course, weather station comes from a long tradition (especially in Switzerland), with analog devices such as thermometers or manometers. Perhaps the oldest analog device would be the weathervane. I was thinking about this a sort of metaphor of information-pull device. Which is obviously opposed to information-push device (to which the ultimate stereotype would be the swiss cuckoo-clock as Frederic Kaplan stated in a talk I attended last week). It's only two metaphors for how information can flow from source to "users": (a) Information Pull, where a user takes (or is given) the initiative to get it, (b) Information Push, where a supplier takes (or is given) the initiative to deliver it. It might be a bit limitative, what are the options in between? What can we learn from weathervane or cuckoo clock behavior? Is there any manual about designing cuckoo clock or weathervane?